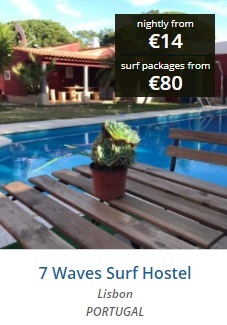 Lisbon, Portugal is a unique surf destination. Aside from the world-class setups that are littered around the coast, it’s also a melting point of cultural history, cuisine, and art. You can start the day with traditional custard tarts and coffee before jumping in the sea, head to the cities art galleries at lunch and then surf the sunset session before partaking in one Lisbon’s super fun nocturnal activities. While Portugal has come to the forefront of big wave surfing, with the mountains of water seen at Nazare, Lisbon handles swell from three to twenty feet. On any given day, somewhere in the Lisbon area will have a fun wave. The West Coast and the Costa Caparica offer consistent beach breaks that can have super-hollow peaks, with relatively quiet line-ups. The Estoril coast offers shelter from solid NW swells and winds, and has pretty much every type of wave you can imagine, from reefs, points, river mouths and beaches that are world-class. Carcavelos is undoubtedly the king of the Lisbon surf scene. Only a ten-minute drive from the city center, there will always be a wave here, but when a solid SW swell fills in and the Northerly wind blows. This beach break does its best Puerto Escondido impression. It just requires a 3/2mm steamer. With great weather, delicious fresh seafood, stunning architecture and perfect waves, Lisbon is making a charge as one of the best European surfing destinations. Editor’s Note: This feature was done in partnership with our friends at Surf Holidays. Check out their second pick for May: The Mentawais.